Training courses run by EFT Master Tania A Prince conform to the guidelines set by AAMET International. 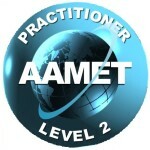 Practitioner training to the syllabus of the AAMET requires currently that students attend three days of live training. This training is made up of level 1, which is a one day duration of eight hours and level 2, which is two days. The level 2 is technically considered to be the practitioner training, however to attend this you need already to have attended the level 1. During the level 2 training students are accessed by the trainer to ascertain whether they have a attained the standard required to go forward to attain an EFT Practitioner status. This is an informal assessment.This evaluation is mainly made using the criteria of safety. Is the person working in a safe way? Are they taking on board the concepts taught at this level? After attendance at the EFT level 2 training module, trainees are required to do a multiple choice questionnaire. This can be submitted by email although plans are in place to make this an online submission at AAMET’s website. Students also need to complete a minimum of three case histories that demonstrate a level 2 competency. The students are required to use techniques taught on the level 2 training in these case histories. The two key elements required to pass this level are that the case histories show the student practices in a safe way. Also that they evaluate the clients safety and work within these boundaries to maintain a safe therapeutic environment for the client. The other key factor is that they demonstrate competency in whichever technique they use during the case history. The AAMET supplies templates for case history submission in order to help the student know what is required from them. After successful submission of the post training requirements the students name and email are submitted to AAMET International by their trainer. The AAMET then invite the student to join the organisation and submit their details onto the Practitioners register.